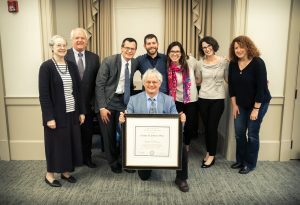 Dr. Lloyd Kramer, 2018 Johnson Prize recipient (center) and his team at the Carolina Public Humanities. Dr. Lloyd Kramer, Director of Carolina Public Humanities and Professor in the Department of History at UNC-Chapel Hill, is the 2018 recipient of the George H. Johnson Prize for Distinguished Achievement by an IAH Fellow. Presented by the Institute for the Arts and Humanities, where Kramer served as Associate Director from 1992 to 2002, the Johnson Prize is a lifetime achievement award. The IAH began granting the award in 2008 to honor George Johnson, one of the Institute’s greatest ambassadors, as well as highlighting commendable contributions by UNC faculty in the arts, humanities and qualitative social sciences. The biennial award provides the recipient $7,500 and banquet in his/her honor. Janet and George Johnson hold this award in high regard, especially for a colleague and close friend like Kramer. “I am deeply honored to receive the George Johnson Prize for Distinguished Achievement by an IAH Fellow. An honor like this—which could go to so many qualified people—therefore comes as a surprise but also as an affirmation that what we do can make a difference,” said Kramer. When Kramer first arrived at the Institute, he received the mentorship from Ruel Tyson, the Institute’s founder. Kramer spoke that his experiences at the IAH deeply influenced much of his work in the humanities at UNC, such as gaining new insights into the intellectual power of the humanities, the value of intellectual institutions and communities, and the pleasures of interacting with people both inside and outside the University who constantly bring new perspectives to the table. Kramer was presented the award at Hyde Hall on Friday, Nov. 2, with friends, family and colleagues from across the University to celebrate his accomplishments.